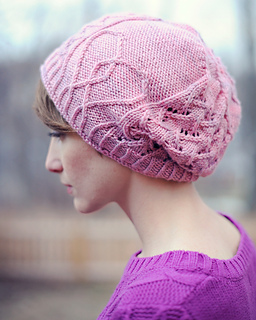 A slouchy, lace and cable hat inspired by E.E. Cummings’ poem “I Carry Your Heart With Me“ and originally designed for Woolgirl’s Poet’s Club in February 2013. Pattern includes written and charted directions for one size to fit the average adult. Basic knowledge of cables is recommended. Pattern is written for one size to fit the average adult. Measurements are taken post-blocking and at rest. YARN: Approximately 200 yards of dk or light worsted weight yarn. 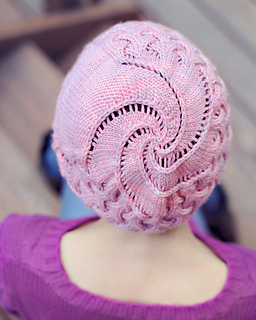 Sample was knit with Studio June Yarn MCN Light Worsted in the “I Carry Your Heart” colorway (230 yds/100 g per skein). NEEDLES: Double pointed needles and 16” circular needle in US 6 (4mm) or size required to obtain gauge AND two sizes smaller.